Posted in TFW's news on January 14, 2015 by Foiling Week. Some of the biggest names in America’s Cup sailing are here at the McDougall + McConaghy 2015 Moth Worlds, honing their skills, team bonding and generally coming to grips with the exciting foiling Moth. America’s Cup team Emirates Team New Zealand (ETNZ) is no exception. Dean Barker, Ray Davies, Glenn Ashby are experienced AC team members. The 2012 Olympic 49er silver medallists Peter Burling and Blair Tuke were added to the Team this time last year, their talent and flare an obvious asset, highlighted by Burling leading these Worlds by a large margin heading into tomorrow’s racing. “We’re sailing against our crew mates from other classes, Olympic team mates and mates in the other America’s Cup Syndicates (Oracle Team USA, Artemis Racing and Luna Rossa),” Ashby, a sailmaker points out. “It’s every man for himself, but once we’re ashore there’s lots of friendly banter and laughter,” says wing trimmer Ashby, who was head coach with Oracle’s 90ft trimaran for their 33rd America’s Cup win. The Victorian-based sailor has more multihull world, national and state titles as a skipper than you can count on your fingers and toes. And he is a Tornado Olympic silver medallist from the 2000 Games with skipper Darren Bundock. 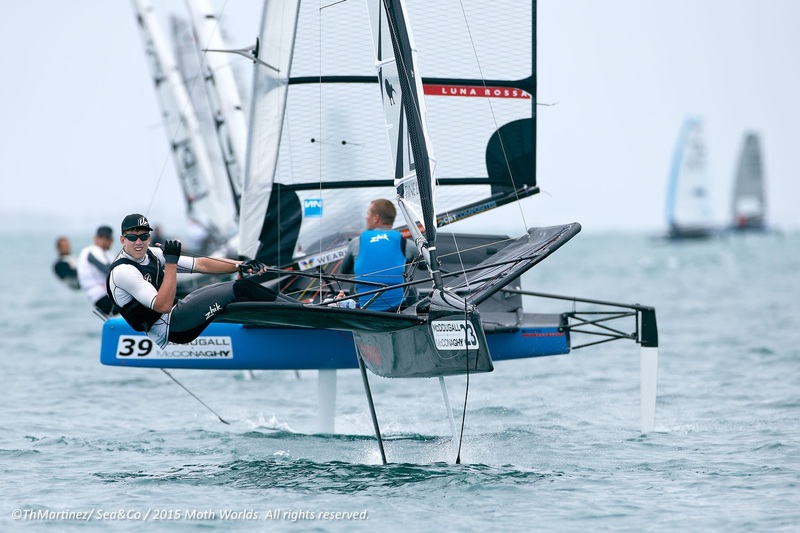 The whole idea of being at the McDougall + McConaghy Moth Worlds, Ashby says, “came from us (ETNZ) doing the A-Class Worlds last year in Takapuna, New Zealand, where Ashby won his eighth consecutive A-Class world title. Notably, Tuke and Burling were second and third respectively. Ray Davies was fifth. All were sailing foiling A-Cats. “It’s good for team bonding, morale and developing as a group. It helps us technically too. The Moth is a step up. It’s a very technical boat,” Ashby says. The 37 year-old says the entire ETNZ team sails various classes. “You definitely have to sail as much as you can, because the America’s Cup game has changed vastly over the last two Cups. The Moth goes hand-in-hand with the America’s Cup. While guys like Davies, Barker and Ashby are the experience of their AC team, Ashby says it’s great to have the young blood of Burling and Tuke. What brought them undone to an extent were the lay days. “We were in full maintenance mode during the lay days. They learned to sail their boat faster in that time. We didn’t get any worse, they just got better. They did a fantastic job. Every delay seemed to play into their hands. We nearly had it, until a race we were leading to win was abandoned that day. “Losing was brutal and the people of New Zealand were brutal. When they love you and what you are doing, they really love you. But when things go wrong, well, they are brutal. “But it’s still the best sailing I’ve ever done in my life. It was an amazing journey. We set the bar early on and kept it going. Not being able to finish it off was soul destroying,” Ashby openly admits. Ashby says they are now looking forward to the next Cup. “Dalts (Grant Dalton) is still running the show. He’s a good leader and operator in every respect. He’s the guy who has to make the hard decisions, and he does because he is so passionate about the sport”. So here they are at the McDougall + McConaghy 2015 International Moth World Championship and doing well. Burling is leading by 11 points with two days of racing left. Tuke is 13th, Ashby 15th, Davies 21st and Barker 29th. “I hope I can move up the standings a bit. My boat got smashed into in one race, which left me out of the next. We’ll see…,” Ashby ends.